A Baltimore Woods summer tradition for over 30 years! 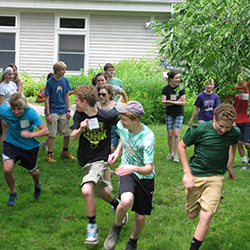 This is the core of our summer camp programming, week long day camp adventures that promote discovery, physical fitness, problem-solving skills, social interaction, and awareness through direct contact with the natural world. Campers will find crayfish in the streams, build forts on Peanut Hill, explore the wonders of the beaver pond, catch frogs at Phillips Pond, build a campfire, roast hot dogs, get up close and personal with the swamp, play classic Baltimore Woods camp games like Camouflage and Kick the Can, make new friends, learn about the trees and birds, and get connected to the natural world in real and meaningful ways. 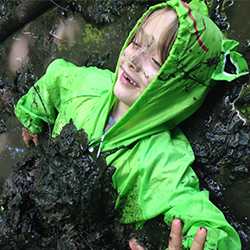 Our camp counselors are NYS certified teachers, experienced in working with children, with an eye for safety, and they know how to have healthy fun outdoors. 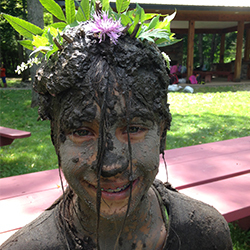 Each counselor leads a group of no more than 11 campers on daily adventures around The Woods. Counselors are all certified in CPR and carry walkie-talkies and first aid kits at all times. 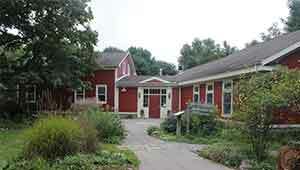 Camp runs daily from 10am-3pm, children sign up on a week-by week basis. Campers are encouraged to attend multiple sessions, as every week provides something new and unexpected. Before and after care available. The Kick-the-Can game tradition started on the first day of camp going back more than 25 years. It is a game of hide-and-seek. It is the most requested game by campers. Each group will get several opportunities to play the game throughout the week. 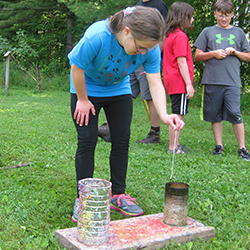 Harkening back to the original establishment of Baltimore Woods as a nature center, campers will have the opportunity to make their own hand-dipped candles. A classic nature education game teaching the concept of predator prey relationships and camouflage. It’s hide-and-seek with a nature twist. 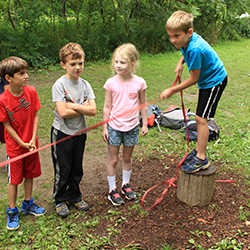 A game of balance and strategy, this traditional lumberjack tug-o-war game has become a camper favorite over the years. Discounts apply beginning with the second child and/or second week.